including the story of KOITOYA, which I decided to name my business after. ‘CONNECTION’ is the word to describe my philosophies. In some cases Connection is the drive for my creation, and in other cases it lies in the customer’s story. This tea box is inspired by the folk story, Tale of the Water Calling Carp. When the Kuzu shrine was constructed in Hida-Hagiwara (Gero-city, Japan), a famous carpenter carved a Koi (carp) into the wooden beam of the main building. Due to its connection to water, the Koi was believed to protect the wooden shrine from fire. However, in this case, after carving the Koi, so much water came to shrine and the area around it in the form of typhoons and floods that the people started to think the Koi had magical powers. To lessen the water attracting powers of the Koi, they carved an arrow into the beam which pointed to the Koi and the flooding stopped. This “Koi to Ya” (Carp and Arrow) tea box was inspired by this story and has a pattern of arrows in the joints around the sides of the tea box with Koi carved into the lid. What I find from this story is the balance between nature and human life. An essential item such as water can also be destructive. Humans wish to control uncontrollable nature, but are forced to respect nature`s forces. I feel like the arrow in the story, in that I am trying to use materials in a way that can control the diversity of the natural forest. This may be a dream, but humans must understand and respect the whole forest, and the timbers in it. The Japanese word "Chigiri" means butterfly joint but also refers to a strong connection. When given as a gift, these Chigiri plates demonstrate the giver’s personal ties to the receiver. My work is characterised by the word “CONNECTION”. 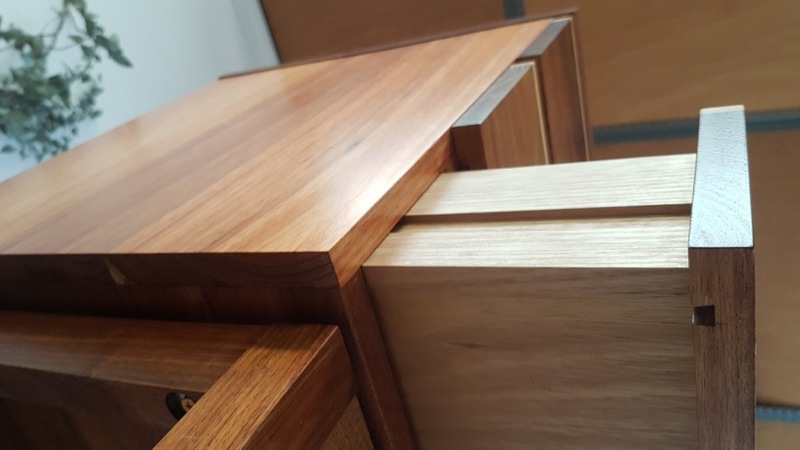 I use traditional joinery to construct my work and try to connect local resources to people who want to use them. Glass coating finish able to be hand washed. Oil finished for dry use or to for regular maintenance. CONNECTING YOU TO LOCAL & SUSTAINABLE TIMBER RESOURCES THROUGH CHIGIRI. Gordon specialises in the recovery and milling of urban trees. From his family property near Hall, he mills and salvages trees and recycled timber. By bonding two different timbers together, these plates are designed to make good use of unused narrow timbers obtained from sustainable forestry activities in Gifu, Japan. Thor’s Hammer designs and makes furniture and architectural products from recycled timbers. The beauty of recycled timbers lend them for use to make Chigiri. Sassafras Nuts is a commercial chestnut and walnut farm located at Sassafras NSW. They regularly have fallen down chestnut trees which is my favorite timber to work with. Tony Blattman's statement encourages me to support customer’s needs through my woodwork. "Tonight marks two years since my dear dad died. I can now think about him and smile. Amongst many other things, he owned a furniture shop in the swinging 60s, back when all that groovy Danish furniture was brand new on the scene. We grew up with the best stuff at home and didn't even realise it. 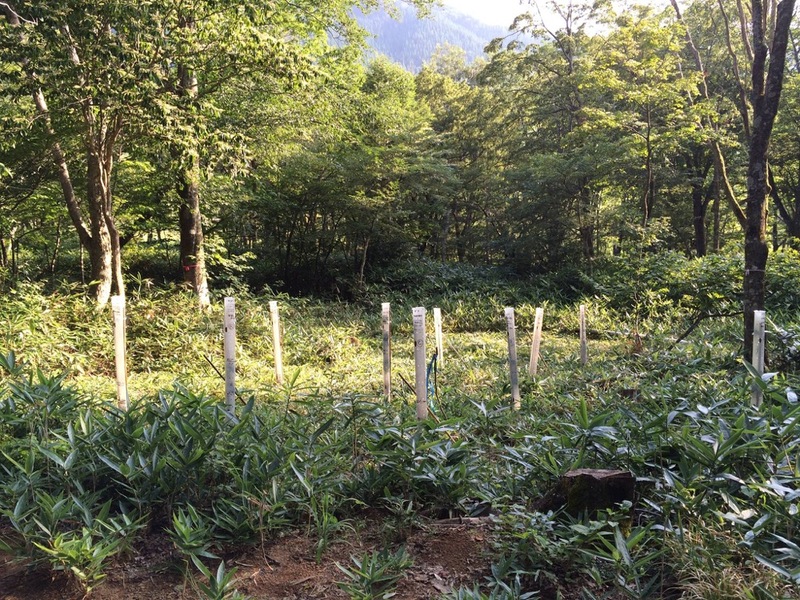 I established the Mono Mori Network for Sustainable use of Japanese hardwood forest in Japan in 2006. This project is still evolving and I am lucky to be able to visit the same forest every year. From 90 years old secondary growth forest, we carefully select the good quality trees to be left for future use, and cut down selected trees that will ensure the sustainability of the forest. We supply these trees for craft and furniture timber. We ensure the reproduction of the next generation of forestby helping natural secondary growth, or re-planting the existing seedlings. 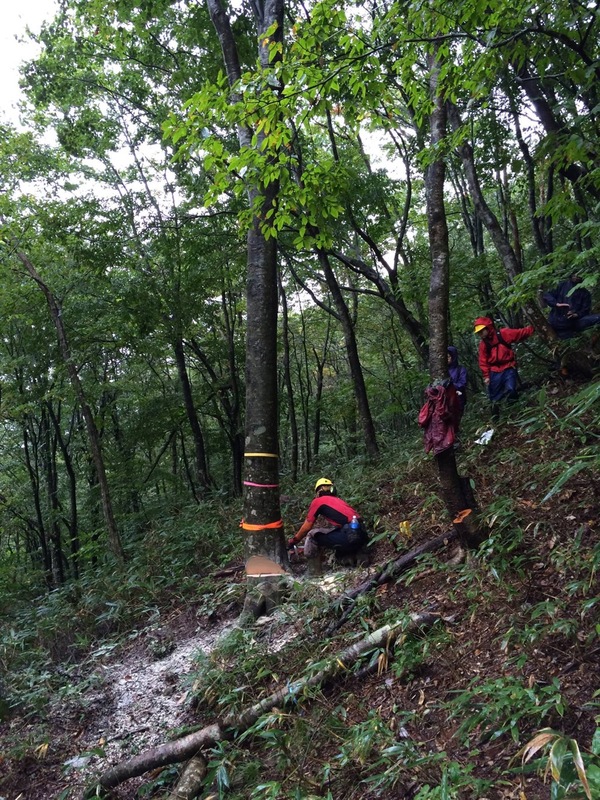 The biggest success of this project has been the networks formed with various people to bring them to the forest and involve them in the evolving project. In 2016, we started a collaboration project with Jiyu Gakuen collage in Tokyo. We will make sets of desk and chairs out of the forest timbers. The school will be a part of the process from forestry to furniture making, as well as growing their ownseedlings for re-planting. I hope to develop this kind of community development project in Australia in the future. Mino Niwaka-Chaya Service station is an award winning architecture design by Mitsutaka Tsuji (Japan). It was built in 2007 and I was in charge of internal design aspects which involved designing the furniture and working with local craftmakers. My biggest motivation was to use local resources by tracking the origin of all timber used. This project was based around using the 7 trees, which is quite different to normal where the timber is sources after the project commences. The photo shows the chair next to the stump of Beech where the material was sources from, and also shows the protected Oak tree with pink tape which will be preserved for use by future generations. I believe that furniture makers have a big role in assisting the community to better manage the use of forest materials. I am fascinated by the Japanese joineries. I choose each joint based on its practicality. 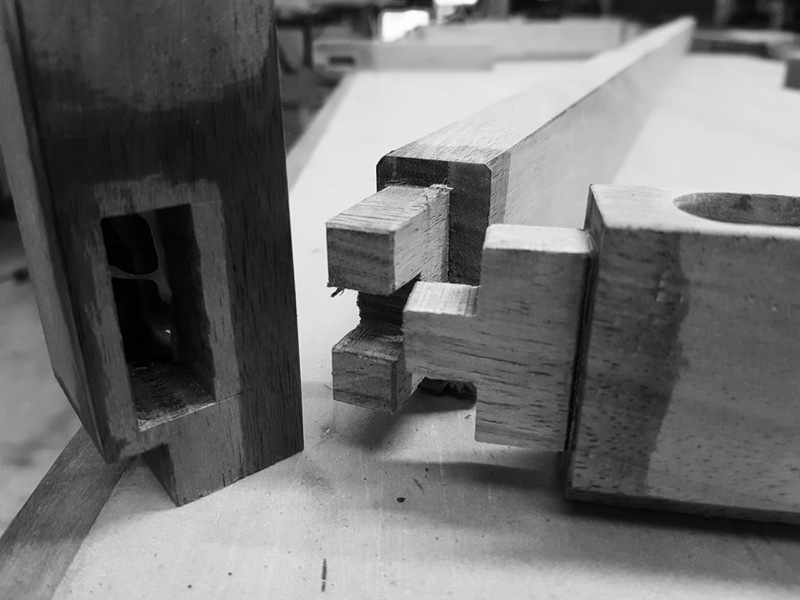 I love the detailed chisel work required in some joinery. When I am chiseling out the corners of Chigiri, my mind is blank, like a form of meditation. I design the work so that the joints tell a part of the story.